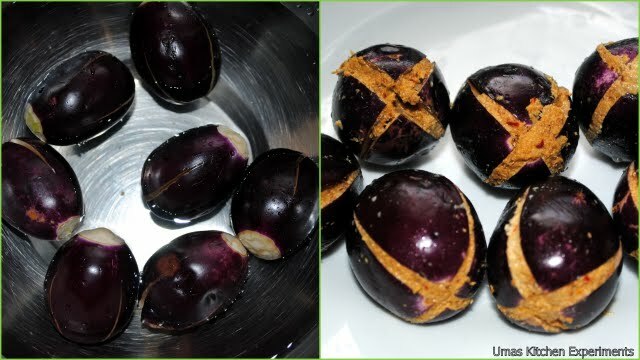 I am not a big fan of Eggplants, but I eat them only when my granny prepares this recipe. This recipe's credit goes to her and her version is slightly vary as she never adds coconut. This recipe tastes good even if you don't add coconut. This ennai kathirikkai kulambu is one of the typical south Indian gravies which will be definitely liked by all. Tender eggplants are stuffed with the roasted masala mixture and shallow fried in oil to get it cooked and again it is simmered/cooked in masala tamarind gravy to get the traditional taste. It is quite simple but requires few additional steps to make perfect gravy. 1) Soak Tamarind in warm water for 15 minutes and extract the juice from it. Keep it aside. 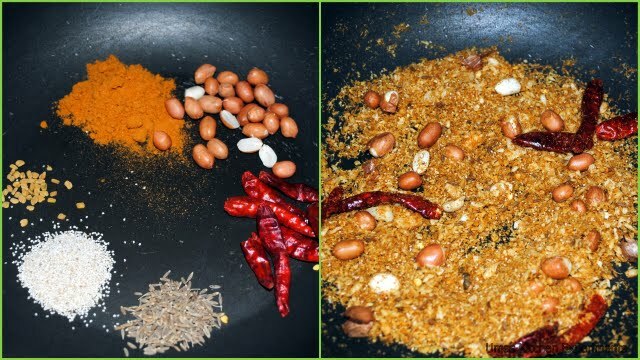 2) In a dry pan, dry roast all the ingredients given for roasting except coconut, onion, turmeric powder and salt. Roast well till you get nice aroma and towards the end, add grated coconut,salt and turmeric powder. Give a quick fry. Transfer it to another plate/bowl. 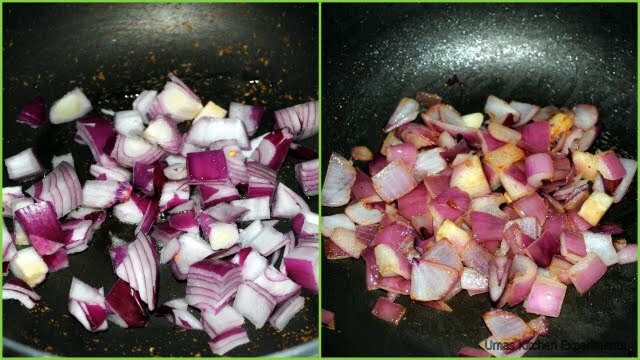 3) Add a teaspoon of oil and onion in the same pan. Fry them till onions are soft. 4) Allow the mixture and onion to cool and grind it together to a smooth paste by adding little water. Keep it aside. 5) Take baby eggplants and cut them into four without breaking them. See the picture for reference. 6) Stuff them carefully with the masala mixture which we prepared in step 4. It might take approx. 1/2 to 1 teaspoon for each eggplant. 7) Now, Take a pan and heat the remaining oil. 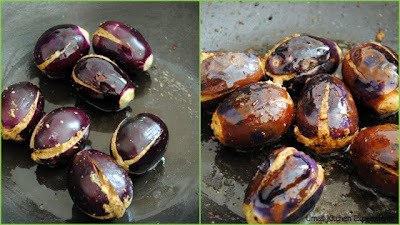 When they are hot and not smoking, add eggplants and fry till they are soft and half cooked. Transfer them to a plate. 8) In the same pan, add mustard seeds and urid dal. Allow them to splutter. 9) Add curry leaves, remaining masala mixture and tamarind water. Add approx. a cup of water or more according to your desired thickness. Adjust for the salt now by tasting gravy. 10) Wait for the gravy to boil. when it starts boiling, add oil fried eggplants. 11) Reduce the flame to medium and cook till the oil oozes out from the gravy. Remove from heat at this stage. 12) This Gravy best pairs with steamed rice. Wow .. so inviting and tasty .. love it. one of my fav dish with brinjal but i do it without stuffing. i'll try urs..bookmarking it. Aromatic & oh so flavorful curry...Loved d rich color!!! 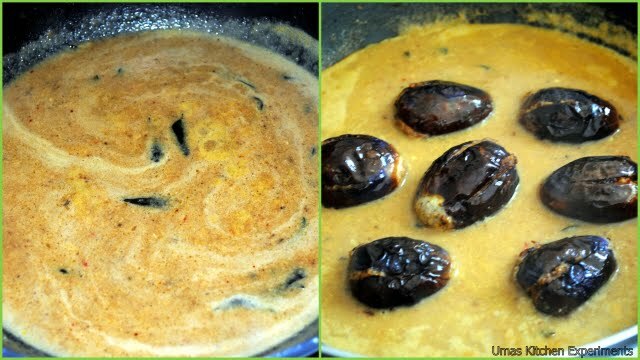 One of the best looking eggplant curry I have seen in a long time ~ very nice recipe n well explained too! mouth watering kulambu...and nice pics. @ Anonymous, Glad it came out well.. Thanks for the feedback.